Brandon Richey, golf course superintendent for Lake Nona, Timothee Sallin, president of Cherrylake Inc., Rick Orr, owner of APL Lawn Spraying, and Matt Bruderek, head groundskeeper of Orlando City FC, all participated. The four discussed how they first got involved with social media and what they started using social media for businesswise. Richey found Twitter was a platform for sharing ideas and discussing products with other superintendents. Sallin liked to use his company’s social media to foster good will with potential customers and found that Facebook was one of the best ways to reach his Hispanic workers. Orr started off with a blog answering customers’ concerns and questions, and Bruderek uses Twitter to discuss new products, as well as reach fans of the football club. When asked when they knew what a powerful tool social media is, Bruderek realized it when his social media usage was brought up during an interview. Sallin found he was getting a different profile of applicants when he started using Facebook as a recruiting tool. Orr found his website had far greater reach than he knew when people from outside his St. Petersburg, Florida-area began calling him about having him come spray their lawn. 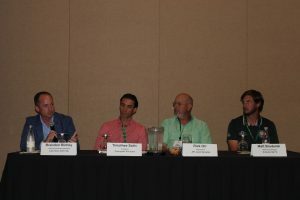 From the landscaping business to the golf course industries the sharing of knowledge is very different on social media. The golf course superintendents use Twitter as a huge support network where they share what works and what doesn’t in an effort to bring the golf course industry up as a whole. On the lawn care and landscaping side of things, the business is more competitive, and successful spraying techniques and the like are closely guarded. Yet, they are more likely to trust product manufacturers because they know the companies want them to succeed. The panel’s advice to fellow professionals about using social media includes Sallin’s suggestion to post every day and share pictures of products and ideas. He says it is important to cultivate one’s brand and be authentic. Richey said to remember who your audience is and Orr pointed out that it is social media, not advertising media. So get to know your customers instead of trying to sell them something at all times. Bruderek says to keep accounts professional and positive.